mamoworldJSON allows you to connect any property within your After Effects project to a JSON file. Need to frequently change your texts, colors or other data? Just select the property you want to change, click the connect button and mamoworldJSON will create a JSON file with those properties already linked to it. Whenever you update the data in the JSON file, the project updates itself automatically. 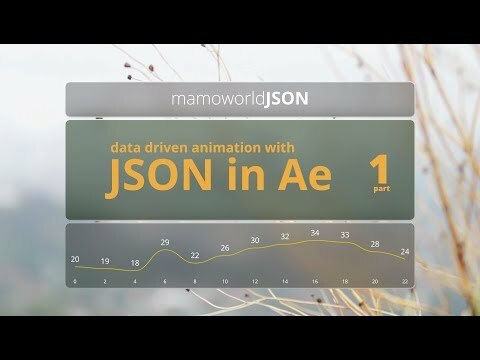 mamowoldJSON is based on the new data-driven animation features for After Effects CC. Normally, data-driven animation would require you to import text files (csv or JSON) into After Effects and then manually write expressions to link your properties to the data. Not anymore! mamoworldJSON is the easiest way to get started with this kind of animation. It creates the JSON file and the expressions for you, so there’s no need to do any of it manually. Support for most types of property – you can link texts, colors, 1D-, 2D- or 3D-properties, and even paths. flexible color formatting – colors can be specified in the JSON file in various formats, including Hexcode, RGB array with a range of 0-255 and RGBA array with range 0-1. So, to get white you could use either #ffffff, [255,255,255] or [1.0,1.0,1.0,1.0]. easily turn layers on and off – when you link the opacity of a layer to the JSON data, instead of specifying an actual opacity value you can also write any of the following keywords: "yes", "true", "enabled" or "show" to set the opacity to 100%; use "no", "false", "disabled" or "hide" to set it to 0%. Expressions that are easy to modify – if you want to do more complex calculations with the data, it’s very easy to tweak the expressions generated by mamoworldJSON. We designed them in a way that hides the complexity but makes modifications as simple as possible. The complete infographic creation toolkit for After Effects.